So today I decided to do some yoga after my run and weights yesterday. 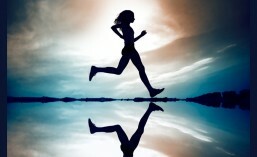 I followed this youtube video below; its yoga for runners. I actually quite liked it. It is funny cause just the other day I was saying how when i stretch my quads I don’t feel like im getting that good of a stretch because I don’t have that tight feeling but I figured its just cause they aren’t really tight…. well around 20 mins into that video there was a pose to stretch your quads and boy did I feel it!! I am going to incorporate that pose into my stretches after my run now. Oh and the whole time I was doing the video my cat was also trying to participate by rubbing herself over me. I would be in downward dog and then she would walk under me and her tail would end up in my mouth or all over my face lol. I just didn’t have the heart to kick her out of the room so I let her stay. This entry was tagged cat, Health, running, stretching, yoga. Bookmark the permalink. Yea there is something with yoga and pets!! I wonder what it is…. I recently added Yoga to my workouts, my dog is all over the place. Now he’s getting better, but the first couple of days he would keep trying to lick me and play fetch. 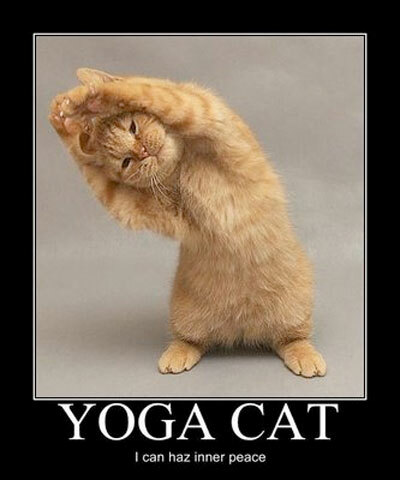 Haha yea I am convinced there is a some kind of link between yoga and pets.